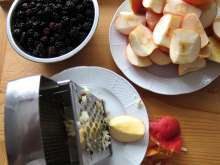 Wash apples, cut them into quarters, core them and grate on a coarse grater. Rinse blackberries under running water in a sieve. If we use frozen blackberries, allow them to thaw and then pour out the possible excess water. Divide the puff pastry in half. 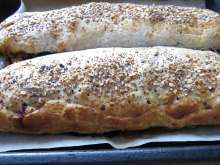 Use a rolling pin to spread one-half until it has size about 40 x 30 cm. 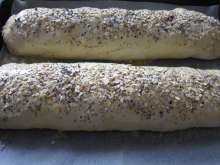 Sprinkle the dough with one-half of the prepared bread crumbs. 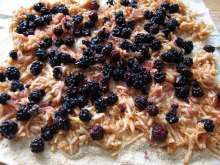 Evenly lay half of the apples and blackberries on the breadcrumbs. Sprinkle the fruit with half of the prepared sugar, 1 teaspoon of ground cinnamon and half of the measured corn flakes. Roll the pastry firmly and place it on the baking tin lined with parchment paper. 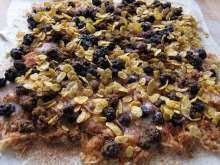 Prepare the second half of the dough in the same way. 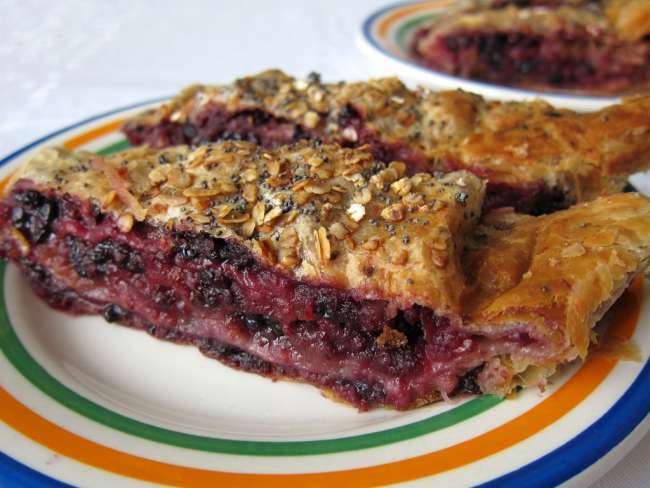 Brush both strudels on the baking tin with beaten egg, sprinkle them with thin-rolled oats and poppy seeds. 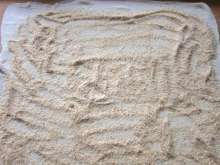 Prick surface of the strudels with fork on several places. Bake at medium warm oven for about 45 minutes. When the strudels are cold, cut them into portions.